This 14K white gold Claddagh engagement ring features a diamond heart comprised of 8 princess cut diamonds with a 0.50ct. diamond weight. The diamonds in this Claddagh engagement ring have a clarity grade of SI 1 and are rated G - H on the diamond color scale. 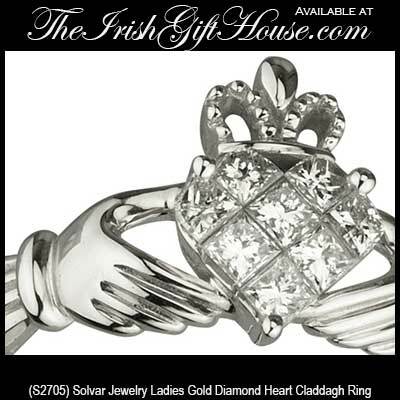 This 1/2 carat diamond Claddagh ring measures 1/2" tall from the bottom of the heart to the top of the crown. 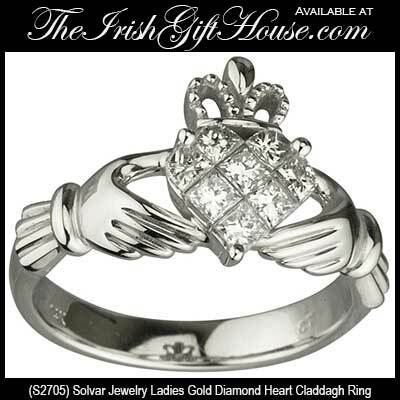 This diamond Claddagh engagement ring is available in sizes 7 through 9, including half sizes.